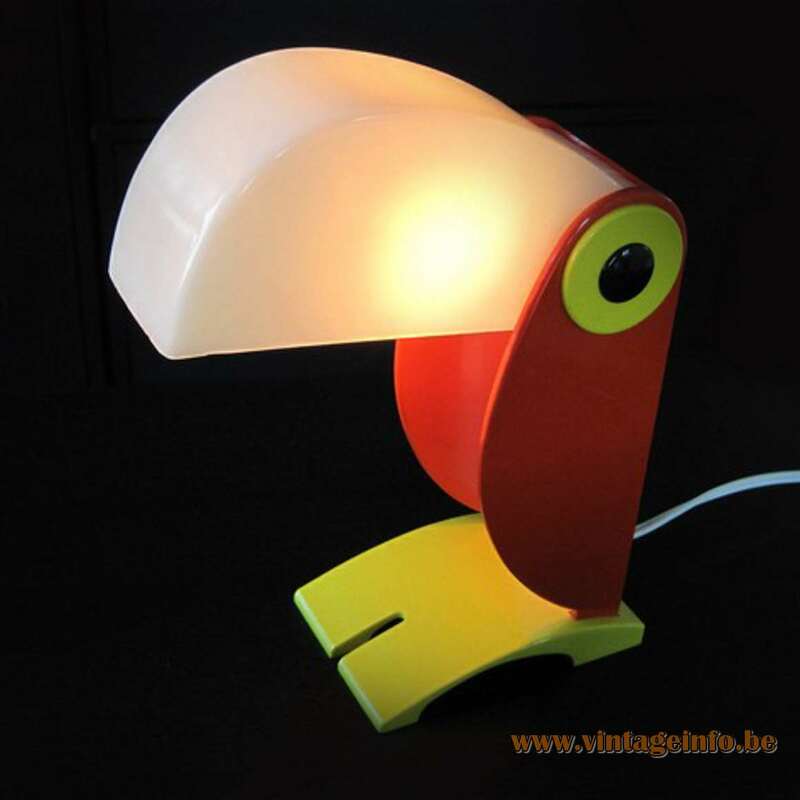 Many thanks to Tinneke for the beautiful picture of the yellow toucan table lamp. 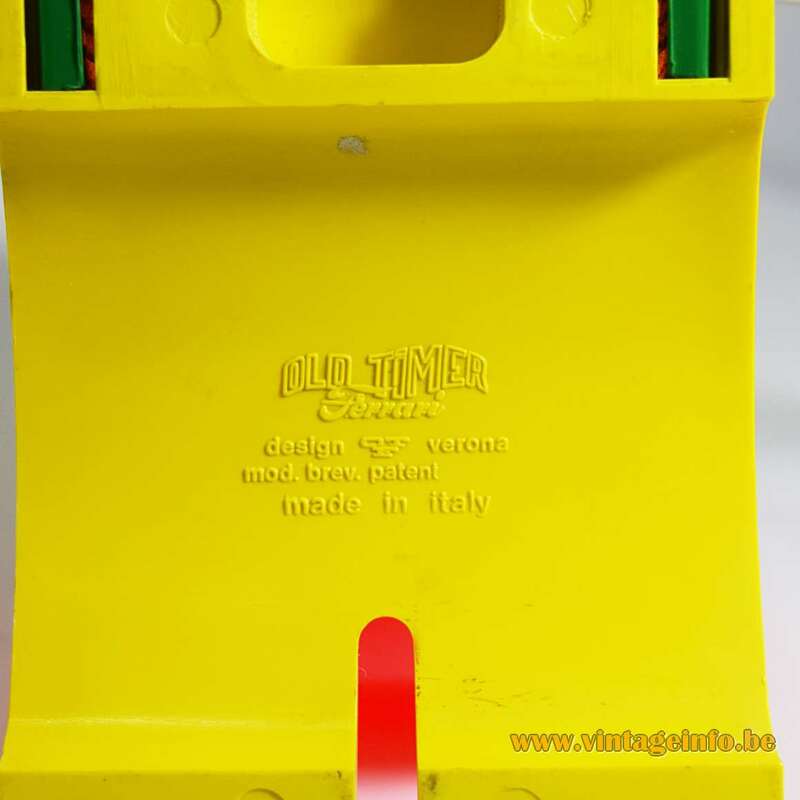 Materials: Yellow, green and red plastic. Bakelite socket. Any type of light bulb can be used, but a small one is preferred. Designer: OTF (Old Timer Ferrari). Manufacturer: Old Timer Ferrari, Verona, Italy. 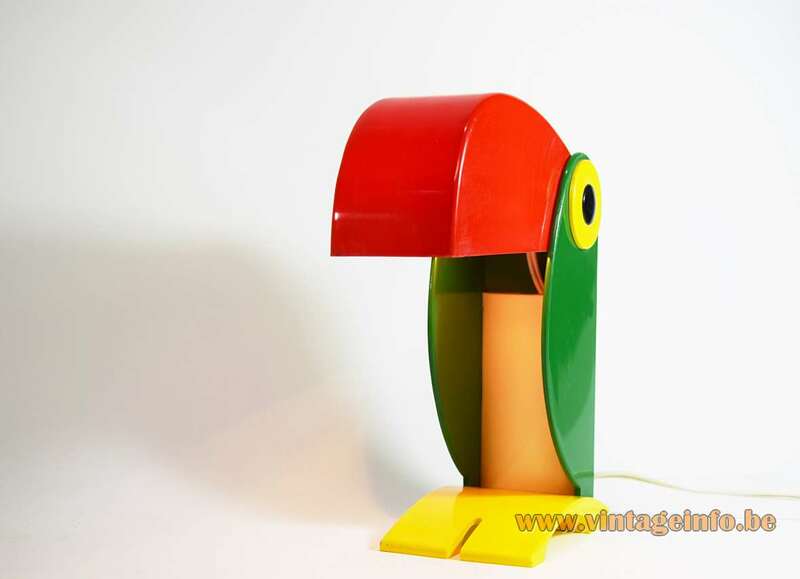 Other versions: these toucan, some say parrot lamps, were made in several colours and 3 sizes; this one is the normal, standard size. 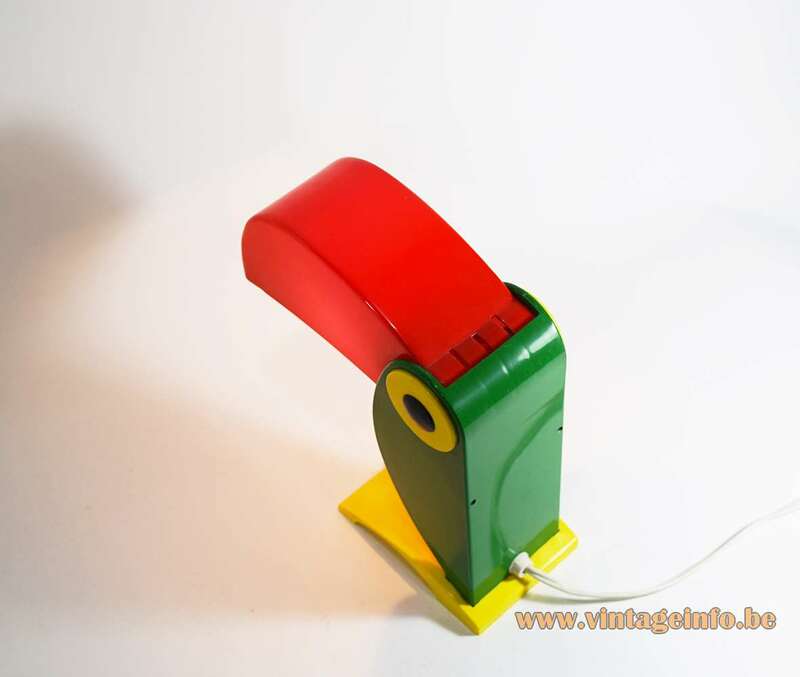 A bigger one (32 cm – 12.6”) was made, and a small one (12 cm – 4.7”) on batteries. 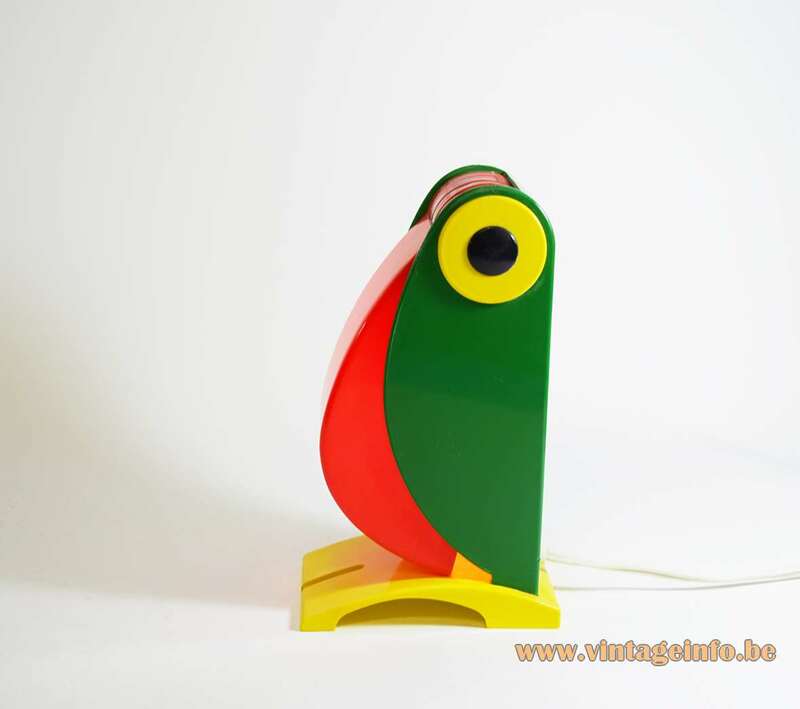 They can be used as desk lamp, table lamp or bedside lamp. Editions exist without markings. In all probability first editions, certainly no copies because everything is exactly the same; dimensions and materials. 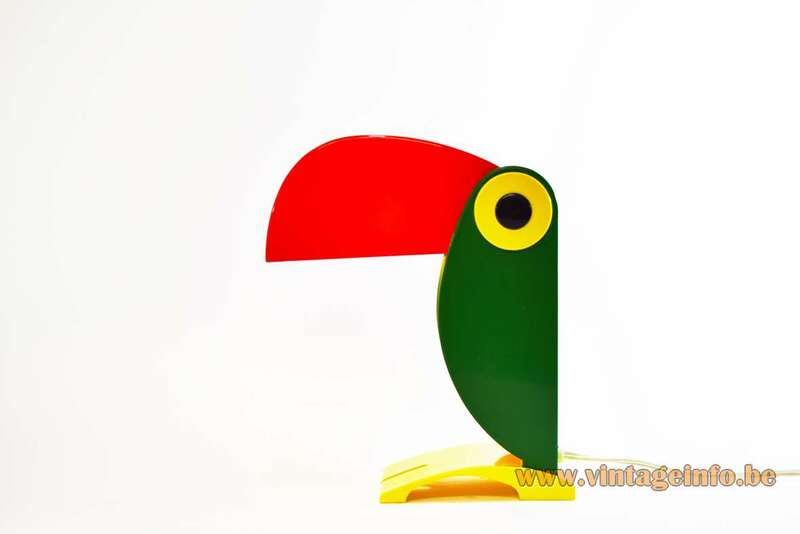 Versions exist with a VLM Components switch from circa 1965 and versions with the Achille Castiglioni VLM Components switch. 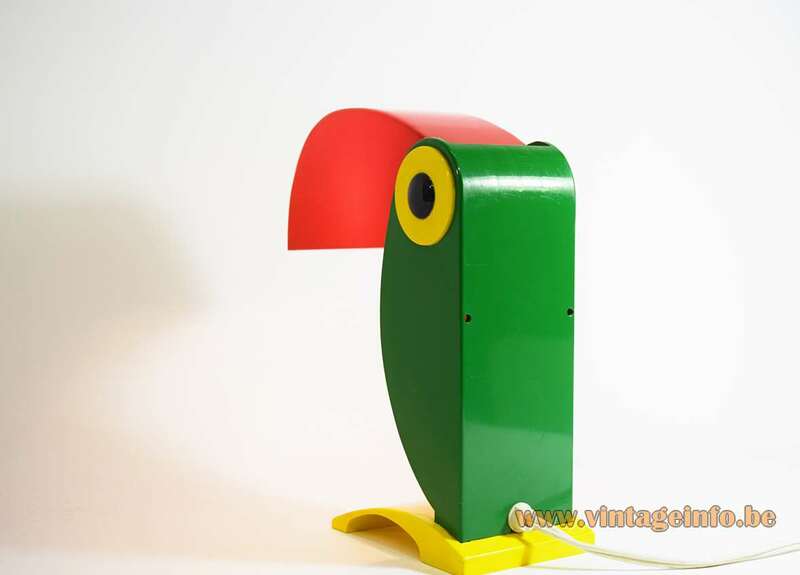 The Achille Castiglioni 475 switch went in production in 1968. 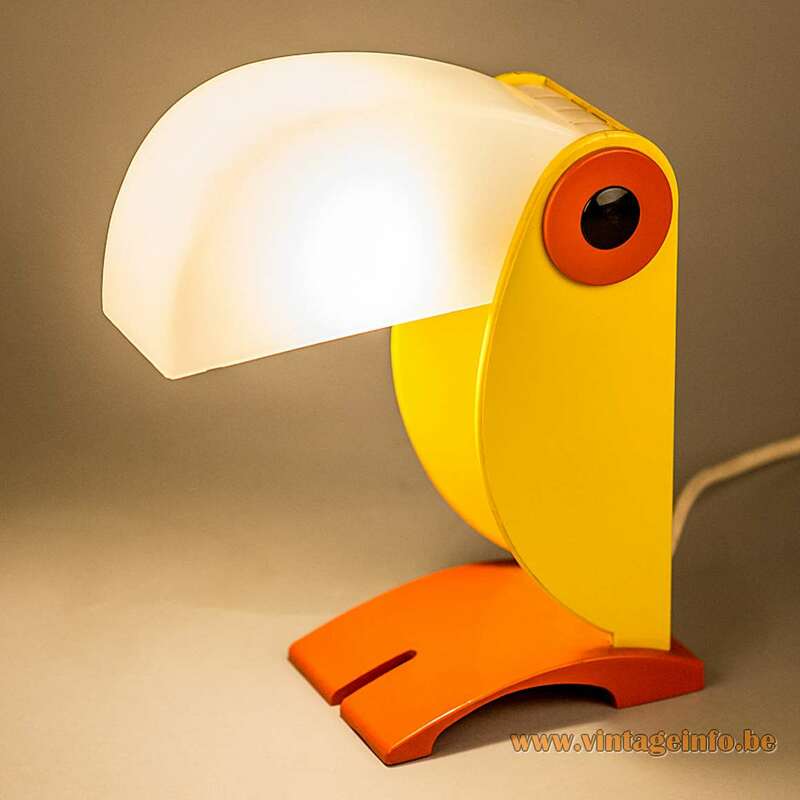 In all probability these lamps were produced from the late 1960s until the 1970s. The O.T.F. company no longer exists. Beware: Never use a incandescence light bulb of more than 25 watts! 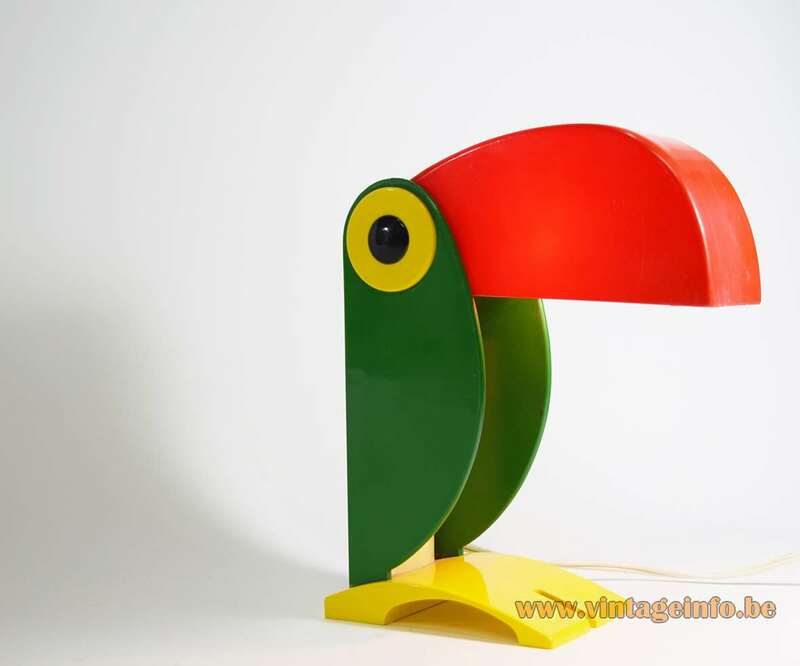 The number of melted toucan lamps is uncountable. 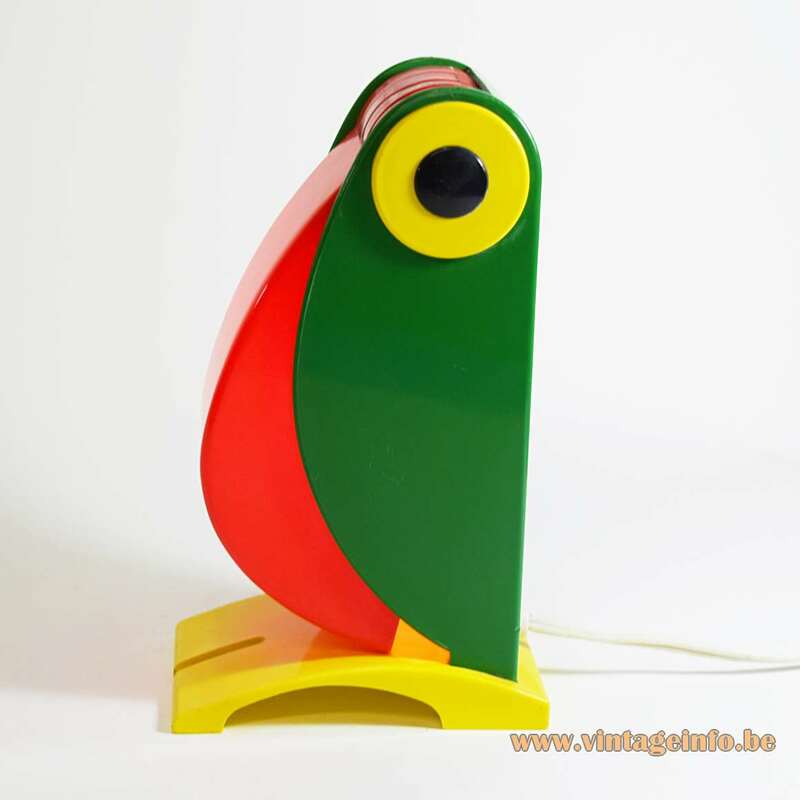 A yellow version of an Old Timer Ferrari Toucan table lamp was used as a prop in the famous Belgian comedy film Koko Flanel (1990). 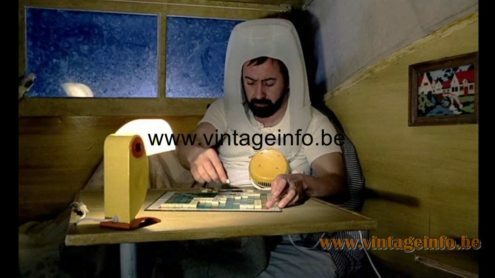 Starring Flemish comedian Urbanus (Urbain Servranckx), Bea Van Der Maat and Ann Petersen. Directed by Stijn Coninx. 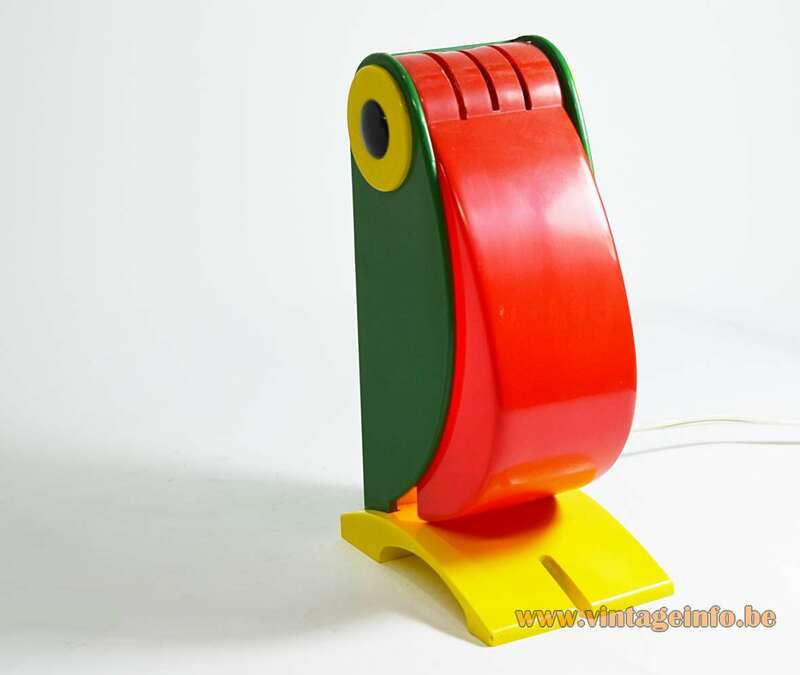 A German Krups Solitair hair dryer from the 1970s was also used as a prop.